The Proton Business Hotel is purposefully intended for provision of business services. Its highest technical outfit level and a combination of comfort and coziness meet the demands of corporate clients and businessmen coming to Moscow, those businesspeople who without having to change their habits or leaving the hotel will be able to do business efficiently at any hour of the day or night and have a full-fledged rest. The Government of Moscow estimated the hotel's achievements deservedly as it awarded the enterprise the annual Crystal Boat Award under the nominations "For a High Level of Hospitality and Quality of Service" in 2000 and "The Best Business Hotel of the City of Moscow" in 2004. 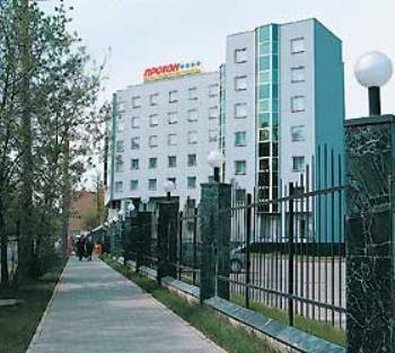 The Proton Business Hotel is located in the western part of the capital city, next to Filevsky Park. The distance to Sheremetyevo-2 International Airport is 80 kilometers. The hotel is 8 minutes from Expocentre, Moscow’s largest exhibition centre. It's also situated not far from the biggest Moscow motorways such as Kutuzovsky Avenue and the Third Transport Ring. On the one hand, this provides quietness and privacy for comfortable work and full-fledged recreation. On the other hand, guests can get to the historical center of Moscow quickly and with comfort. The hotel provides the guests with shuttle-bus that takes them from the hotel to “Fili” metro station. Besides, a businessman can order a car with a driver for traveling about within the city. And to those who are used to traveling by car themselves the hotel offers a guarded parking place. The unique atrium of the hotel filled with light and air has nothing in common with usual hotel lobbies. Galleries decorated with natural greenery stretch throughout the perimeter of the hotel starting from the first floor. The doors of 84 air-conditioned rooms face the gallery. The standard rooms' design is of the classic style. The rooms have single and double beds. Each standard room is equipped with satellite television, a mini bar and telephone and can be connected to Internet. There is a separate bathroom with a hair-dryer. The De Luxe rooms consist of a bedroom and a drawing-room. In addition to satellite television and Internet connection, a Suite of this category is equipped with a cordless telephone, fax and personal safe. In the bedroom there is a big comfortable double bed. The bathroom is equipped with a hair-dryer. The Suites fully meet all requirements of respectable and comfortable hotel accommodation for businesspeople. They have excellent interiors and are beautifully furnished. A large and comfortable drawing-room is divided into special sections intended for both recreation and work. In the bedroom there is a big double bed. A Suite of this category has an additional washroom for visitors. The bathroom floor is warmed-up and the bath has a hydro massage system. All this luxury is equipped with most modern equipment such as a special Internet connection line, cordless telephone, fax and individual safe. Special exercise bicycles are envisaged for the Suites. The high technical outfit level of the Proton Business Hotel and the ample opportunities provided for carrying out business activities as well as the best quality standards of the latter constitute the main components of the hotel's general philosophy. The conference hall situated on the 3rd floor is very comfortable and at the same time has a strictly business-like style. Its high technical outfit level allows carrying out a wide variety of business activities including not only conferences of local importance but also video conferences and space bridges maintaining contact between the conference hall of the hotel and any location worldwide. For this purpose the hall is equipped with two huge monitors capable of receiving and propagating signals from and to any continent. During conferences simultaneous interpreters are engaged for foreign guests to translate from any language. Three business centres secure provision of top quality business services. The centres are equipped with the most up-to-date office equipment of superior quality. The business centres are convenient for holding seminars, trainings and business meetings. At any of the business centres a guest can get an up-to-date computer for personal use, send a fax or scan documents, send an electronic mail message, watch a videotape recording, play a business training dictaphone tape recording and do many other things. The meeting room is intended for short discussions and meetings of business partners. By a client's request, the room may be equipped with all the necessary facilities of the same high technical and superior quality level as those installed in the conference hall or business centers. Other hotel services include: restaurant, banquet room, bar, fitness centre, billiards, sauna.